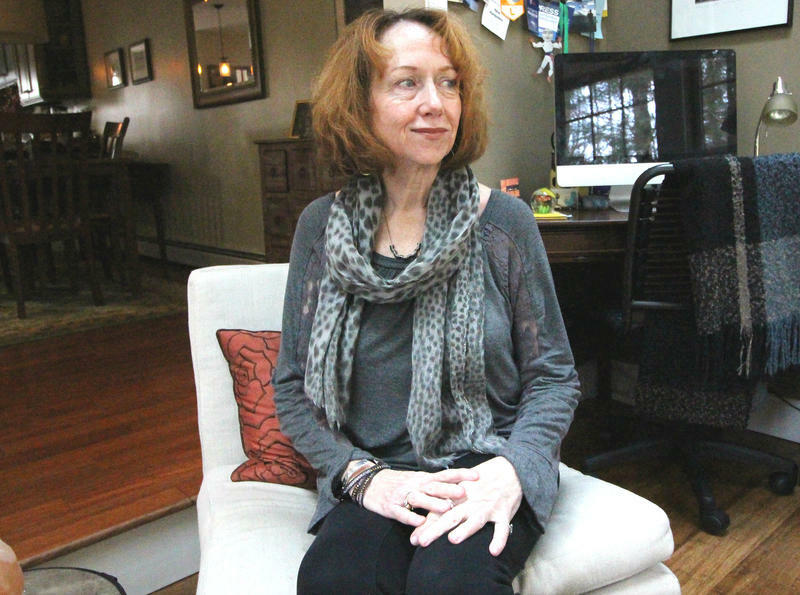 Suzanne Laurent in her home in Portsmouth, N.H. The Bookshelf from NHPR is New Hampshire Public Radio's series on authors and books with ties to the Granite State. All Things Considered host Peter Biello features authors, covers literary events and publishing trends, and gets recommendations from each guest on what books listeners might want to add to their own bookshelves. If you have an author or book you think we should profile on The Bookshelf, send us an email. The address is books@nhpr.org. This week on The Bookshelf from NHPR is Suzanne Laurent of Portsmouth. She lost her husband to a sudden illness in early 2015. His death turned her world upside down, and to cope with her feelings, she turned to poetry. That poetry is now collected in a book that explores loss, love, and grief. It's called Losing Light: A Journey Through Grief. NHPR's Peter Biello met with her at her home in Portsmouth to talk about her poetry and the man who inspired it. Scroll down to read a top 5 list of Suzanne's reading recommendations and a transcript of the interview. 1. Piano Lessons by Noah Adams, former host of NPR’s All Things Considered. "As someone who tried to take up the piano as an adult, I could relate to Adams’ month-by-month chronicle of his year long journey pursuing his lifelong passion." 2. The Art of Racing in The Rain by Garth Stein. "Getting inside the mind of a dog, this book pulled many heartstrings. Our beloved Golden retriever, Kodak, died months after my husband passed away. They were inseparable, and I truly think Kodak needed to join him." 3. Garden Spells by Sarah Addison Allen. "This is an enchanting novel that blends horticultural folklore, supernatural powers and Southern charm. It immediately drew me in with its enchanting characters that are struggling with the joys and sorrows of love and life." 4. The Weight of Water by Anita Shreve. "Since moving to the New Hampshire Seacoast, I have been fascinated by the Isles of Shoals just off the coast of New Hampshire and southern Maine. As a journalist, I identified with the main character, a newspaper photographer, who researches the sensational axe murders of two women on Smuttynose Island in 1873." 5. The Paris Wife by Paula McLain. "Since my husband was born in Paris, I was drawn to this passionate love story of Ernest Hemingway and his first wife Hadley that takes place in Paris during the 1920s. It brings back the timeless feel, scents and beauty of the City of Lights." Tell me about your husband. Who was he? What was he like? I met him in 1981. I was taking a walk in the public gardens, walking my dog, and we kept crossing paths. We were both living in Boston at the time. And I sat down on a tree stump and he walked by and said, “Oh, you look so nice. I wish I had a camera.” And I was like, “Oh, please.” Because I am a photographer as well as a writer. So he sat down and we just started talking and I found out he was originally from Paris. He moved to this country to be near his kids from his first marriage. We got talking, we went out to dinner, and we were together ever since. We married in 1985 and were married almost 30 years when he died. He died from complications of a broken arm—an unfortunate series of events. He had early Parkinsons, so he broke his right arm and he was in rehab to try to get his balance back, because he couldn’t really use a cane too well with his right arm. And he developed pneumonia, went back to the hospital on a Friday. And that Sunday morning he had a pulmonary embolism from the broken arm and that’s how he died. It was sudden. Was there a moment you decided you wanted to start writing about this? No, it just came to me. I’ve always written poetry, since I was little, as a way of expressing myself. I started writing just about six weeks after he died. The poems just flew out of me. I would write them in five minutes and just keep putting them down. A lot of people said to me, “Why don’t you put them in a book? And put some of your photographs with them?” And so I did. You’re also a journalist. So you make a career out of writing prose. What it is it about poetry that can get at these feelings of grief? Can both prose and poetry get at grief? They both can. I could write essays, too, but somehow the poems—most of them are short and they are just very raw feelings that just come out. I just get more when I write them than I would if I was writing a long essay or prose. There was a moment in this book where you go back to France without your husband. What was it like going to your husband’s native country without him? Actually I went there to try to find him, because those were some really good memories I had. I went with my son and I felt—I just couldn’t find him. It was really hard. We went to Paris. I had a lot of good memories in Paris. Things changed. The climate changed there. It was not the same Paris that I remembered. And then we went to the south of France where I had great memories and the little town where his sister still lives. What do you think you’ve learned about grief in the past couple of years? That there’s no order to it. It comes and goes. People think that you’re supposed to have a process of grieving but everyone grieves differently. I think it’s harder now, kind of settled in. It’s real. I think when people first die, you’re so busy putting everything in order and getting things done, and I also had to do things with the French consulate because he was a French citizen, too. There was just a lot of stuff to do. Even though they say you shouldn’t do anything drastic, I did move four months later to where I’m living now. I think I put grief on hold. What I would tell people is: there no process. You just need to feel your emotions and go through it. If you feel like crying, cry. If you can’t or you feel like you’re not really grieving, it’s okay, too. I mean, everybody’s different. This week on The Bookshelf, author Joe Hill of Exeter, N.H. joins Peter Biello in studio. Hill's new book, Strange Weather, is a collection of four short novels. In one, the sky rains needles that rip to pieces anyone unlucky enough to be outside. In another, a skydiver gets stuck on a cloud. And in a story without any supernatural connection, people with easy access to guns use them to devastating effect. 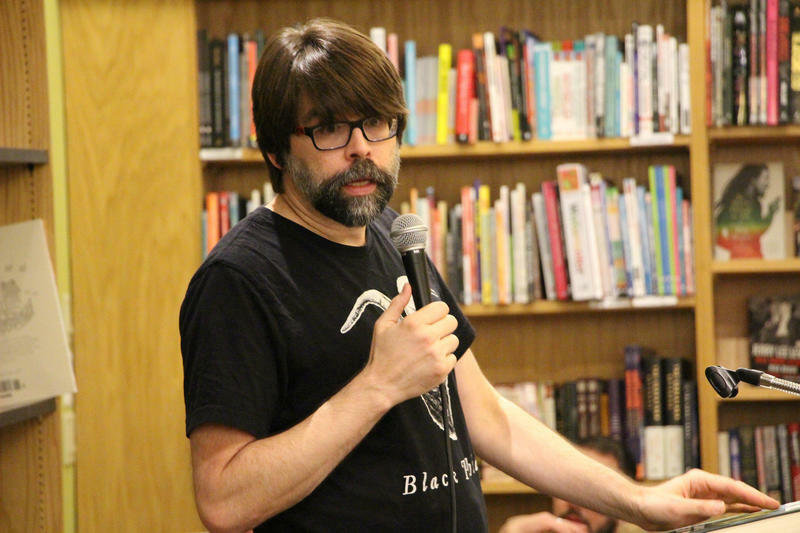 Joe Hill is the author of many works, including the novels Horns, NOS4A2, and The Fireman. Ernest Hebert is best known for his novels. His first book, The Dogs of March, was published in 1979 and cited for excellence by the Hemingway Foundation. It was the first of seven novels in his Darby Chronicles series, which painted a vivid portrait of working class life in rural New Hampshire. In the late 1880s, rail was creeping across western America, connecting towns and changing lives. The west was still relatively wild in those days, and that Wild West is the setting of the new young adult novel by Erin Bowman. Retribution Rails is the story of a young man caught up with a band of cold-hearted killers and thieves and the young woman who aspires to write for a newspaper, any paper, and prove that she can write just as well, if not better, than any man out there. Erin Bowman spoke with NHPR’s Peter Biello.